WebUI Studio.NET 2008 Service Pack 2 has delivered many nice enhancements and features. One of the enhancements available in this later service pack is the integration between WebCallOut and FlyPostBack (AJAX) functionality. I have received feedback from our customers mentioning that WebCallOut is merely a UI component without AJAX/server-side featuer in behind. By integrating WebCallOut and Intersoft’s FlyPostBack architecture, I’m glad to announce and prove that the newly-born WebCallOut is not as simple as it looks, but rather a pure, real and powerful similar to the other Intersoft’s components so far. With this new enhancement added into WebCallOut, you can now assign WebCallOut’s Text or Title not only from client side, but also from server side via FlyPostBack. This new enhancement will certainly add flexibilities in using WebCallOut and therefore results in more advanced scenarios supported. 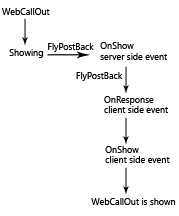 In order to perform FlyPostBack, simply add OnShow server side event in WebCallOut. In OnShow server side event, add the below code. OnShow server side event will be triggered when just before WebCallOut is about to appear/show. For better understanding, I provide WebCallOut’s lifecycle illustration. Hopefully this integration can help developers to gain better web experience. Quoting Intersoft’s motto, we are striving to deliver the best WebUI components that have “insights for a better web experience” for both developers and users. Software Architect, Intersoft Solutions Corp.